Should You Let Your Kids Drive an ATV? There are a ton of different outdoor activities suitable for children. From early spring through the fall many kids will be out riding all terrain vehicles (ATVs) with their parents. 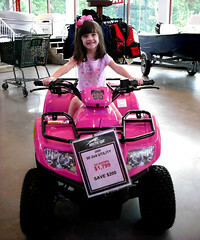 Is your child ready to ride ATVs? That depends on the child–his age, level of maturity, and ability to handle responsibility, among other factors. But whether or not your child can handle an ATV should be decided on a case-by-case basis. And you, as a responsible adult, should ensure that your child is ready for the responsibility before allowing him free rein with the vehicle. There are several issues you should look at before allowing your child to ride an ATV. First, recognize that these can be dangerous machines. Between the years of 1982 and 2008, there were 9,633 people who died in ATV accidents. Of these accidents, a full 27 percent occurred in children that were younger than 16 years old. Even more disheartening is the fact that, in the past decade alone, there was an 88 percent increase in children who died in accidents related to off-road vehicles. This doesn’t mean that ATVs can’t be safe, but when deciding whether it’s safe, or even legal, for your child to drive one, it’s necessary to look at your state’s laws. In Virginia, for instance, a child must be 12 years old to operate an ATV, and the unit must be smaller than 90cc. On the other hand, some states only require that a child be supervised while riding. Giving an untrained child access to a potentially dangerous machine can have serious consequences. But even if your child isn’t hurt by the vehicle, other possibilities may arise. If he crashes his machine, for instance, he may escape uninjured, but if a friend or bystander is hurt, you could find yourself facing liability charges. A Virginia personal injury attorney reiterates how important it is to understand your liability. “Virginia has financial responsibility laws, . . .and this means that if someone is injured… the at-fault driver will be faced with taking financial responsibility for the medical bills.” So anyone hurt due to your child’s negligent acts while on an ATV, which really equates to negligence by you, the parent, for allowing your child drive the machine, may have cause for a personal injury claim or lawsuit. Unfortunately for many, ATV insurance isn’t mandatory everywhere. This means that the liability for property damage and even extensive medical bills may fall on you, the parent of the child who caused the accident. Notwithstanding the law, however, you should always take practical matters into consideration. Consider your child’s size, for instance. The larger the ATV, the harder and more difficult it is to maneuver. If your child isn’t big enough to use his weight to control the vehicle, there’s no way he can safely drive it. It’s also important to always supervise your child and ensure he’s using proper safety gear. First things first – make sure that your child understands how to maneuver an ATV before allowing him to ride one, and that he knows how important it is to abide by the rules. He should know how to safely turn, shift gears, and come to a stop. You should also let your child know that “monkey business” will not be tolerated on the machine due to the possible consequences. The child should know that his ATV privileges can be as easily revoked as they were granted. Additionally, it’s usually a good idea to enroll your child in a recreational vehicle safety course. Regardless of how great you think you are at teaching ATV safety, it’s much more likely that a professional will do a better job. This additional training can go a long way in keeping your child and those around him safe. All terrain vehicles are a great way for adults and children alike to enjoy the outdoors, but it’s imperative to remember that these aren’t toys and that many people have suffered serious injuries through their improper use. It’s essential to ensure that your child, regardless of his age, is properly prepared to handle an ATV and not given a more powerful vehicle than he can handle. As long as proper safety precautions are taken, ATVs can be enjoyed at any age. Recognizing the importance of keeping kids safe, Richard Freeland shares these tips about preparing your child to drive ATVs. Virginia Attorneys at Price Benowitz, LLP, http://www.virginia-personalinjurylawyer.com/, understand that recreational vehicle accidents can usually be prevented if those responsible practice due caution and adhere to proper safety protocols. Their website can help you can learn more about what to do if someone is injured in an ATV accident. For me, it’s okay to teach them ATV. It’s one way of experiencing the beauty of nature. When I was young, I remember my mom and dad teaching me how to ride my bike in a nature park near by. It was an amazing feeling when you ride with your parents in the park trail, it’s like all your problems in school are gone and you just feel one with nature. Of course ATV is on a different level, so it will require more parental supervision.